Whilst inventor Peter Adolph will always be the father of Subbuteo, the Italians have a different hero. A man named Edilio Parodi. From the mid 1970s Parodi's factory in Genoa produced the Subbuteo that introduced so many Italians into the hobby. Although Parodi imported a lot of his Subbuteo items from the UK, his workers did produce and paint their own teams. Luckily, he also produced his own catalogues, which makes life a little easier for us would-be historians! This page is an ongoing project looking at the extra production from Italy, and the major anomalies that seem to occur. Forget all the rules, and enjoy the wonderful world of Edilio Parodi. A big thank you to Andy Mason, and Blackjack who kindly sent me photos of these catalogues. These have now been added to the normal team project, but I've included them here too. These were British sides, and they were sold in the UK under these numbers, but they only appeared in the Italian catalogues (of 1976). Nearly all these team subsequently appeared in the huge 1978 team expansion where team numbers in the English catalogues leapt from 190 to 321 (I'm reserving judgement on a couple of sides). This seems to suggest that the 1978 expansion was at least partly lead by Edilio Parodi. Borussia (M'Gladbach) (Germany) I think! This is technically a unique kit. See below. Hartford Bicentennials (NASL) Became 268 Washington Diplomats (see below). Washington Diplomats (NASL) Became 260 as Hartford Bicentennials. However, note that the diagonal stripes are reversed on 260. Its worth noting that the Italian, Argentinean, and NASL teams are all in alphabetical order. These teams moved en-masse to the full English range in the 1978 expansion, where they were all renumbered in the 200s. As you can see from the details above, this re-number doesn't seem to have had a great amount of logic involved, and of course being Subbuteo, a couple of anomalies are thrown up. Perhaps the one unique team from this flyer is 512 Borussia. This is clearly a Borussia Moenchengladbach kit, although the flyer only refers to it as Borussia. From the pictures I'd previously seen of this, I assumed it was ref 221 (without the shorts trim), as that was Borussia M'gladbach's kit in the British catalogues of the time. However, the team is actually an earlier Borussia kit featuring both black and green stripes on the sleeve. This had been seen in European competition in the 1970s. English collectors may notice a resemblance to reference 199, although there are enough differences (collar, badge, shorts trim, sock trim) to call it a unique kit. Thanks to Alessio Vergani and Carlo Perugini, who e-mailed in with completely different boxed teams of this reference within days of each other. Another team that doesn't tie up to the British catalogues is 522. This was San Diego Toros, and it was obviously spotted that the colours were identical to reference 77. The alphabetical list in the 1979 UK catalogue quotes San Diego Toros as kit 77, so that's all quite logical. Mind you, the two "San" teams are further confused in the 1981 catalogue, Things are fine in the numerical lists, but the alphabetical list has San Diego Toros as 259, and doesn't mention the Earthquakes at all. Opps. A bigger problem than that is Washington and Hartford. In the Italian list, Hartford wore the Tottenham-like kit with the hoop socks, and Washington wore the blue kit with the red and white diagonals. NASL records suggest that this was indeed the correct Washington kit. Somehow, in the English catalogues (and subsequent Italian issues) these teams have been reversed. Another big whoops. 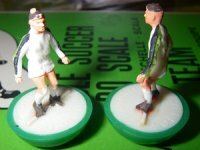 With expanding foreign markets and an ever-growing range of complicated kits, it became clear in the late 1970s that Subbuteo Sports Games Ltd would no longer be able to cope with demand using its old hand-painted techniques. There needed to be a way to machine paint the teams, but there was no way to do this with the heavyweight. So a new figure had to be created. This figure was, of course, the zombie. These seem rushed into production around 1977 because early versions don't even have "Subbuteo" written on the bases. I guess they successfully filled their primary demand meeting role - for instance zombies were the first teams to be sold in Greece. But while the zombie is a nicely balanced figure and the peg bases is a good idea, looks-wise, they are definitely a step backwards from Charles Stadden's delightful heavyweight design. Certainly the Italian punters were very unhappy with this new figure (I'm not saying anyone else was delighted either!). Anyway, Edilio Parodi decided he could make his own heavyweight figures. But I guess his bases were coming from England, and the new ones would be designed for peg fittings. So Parodi produced a hybrid figure - a Stadden style footballer on a peg. Problem solved. Well almost. Parodi had his hybrids produced by a Portuguese factory, and the results were not fantastic. The casting was poorer than the proper Subbuteo figures, and the figure ended up with either a big head or a little one, both of which look fairly comic. See the International Team Production page for more details on Portuguese teams. Of course, the arrival of the lightweight a year or two later made these figures obsolete in any event. These teams appear in the British catalogue from 1981. There are a couple of important points here. First up, references 505 and 510, which are missing from the British catalogues, are not shown here either. So were they in an earlier Italian catalogue, or were they not produced? Also, while the colours are not too good on my picture, one kit is clearly different than the British version. 502 is Roma 2nd in 1981, but here it is "Roma Nuova". A mainly red team, rather than the white one of later years. The hybrid figure also coincides with the other big Parodi contribution to the Subbuteo back catalogue - the C100s teams. These were special hand-painted teams with extra trim and badges, sold in colourful boxes. I'm not sure of the whole period these teams were produced, but they certainly feature in the 1982-83 catalogue. The 1982 catalogue has the specials in a mix of heavyweight, hybrid and lightweight. The website of Stefano Montecchiesi shows these teams, but also illustrates all the h/w or hybrid figures with a lightweight alternative, suggesting that the range carried on for a few years after this. He also shows one extra team not available in 1982-83, and that is Verona. The catalogues neatly divide the teams into National sides and Italian sides. The second picture shows the teams from a slightly later catalogue. Verona (ref 615) possibly the final special? The Italian teams have been well represented in the Subbuteo ranges, and most of these teams seem to match a numbered team (or at least come close). However, Fiorentina seems to be entirely different to any sides in the normal run (in both h/w and l/w incarnations). The Verona looks like it has a Scudetto which would make it 615. This obviously doesn't feature in the earlier catalogues, but might be a final special. There seem to be plenty of these among Italian production. Here are a few that I've heard about. If anyone can confirm any of these points, I'd like to hear from them. 359 - the final Italian heavyweight ?? Long Boxes: Seem to have be available alongside the smaller ones until 1982-83. Whether these were produced in Italy alongside the specials boxes, or whether they had just assembled a big store is not certain. That's it for anomalies for now, but if anyone has seen any different ones, then please send them in. Time to choose another destination I think.